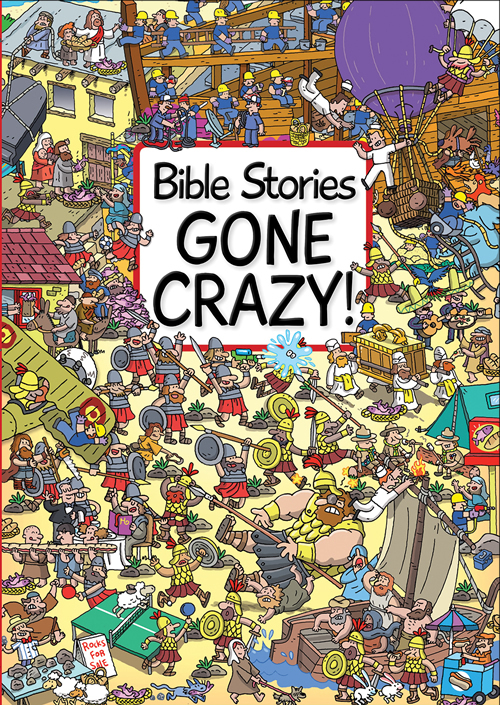 B ible Stories Gone Crazy! is a Where’s Waldo style kid’s book which pictures Bible stories all wrong Noah’s Ark has a sizable, modern construction crew. The parting of the red sea depicts surfers and other water enthusiasts. The destruction of Jericho has a big bad wolf, a wrecking ball, lego blocks and KISS. The David and Goliath story has water guns a hotdog stand, and a world war II plane, The angels in the lion’s den with Daniel are circus trainers and the lion are engaged in a range of recreational activities. Jonah and the Monster fish, the feeding of the five thousand and the paraplegic man let down through the roof have equally ridiculous depictions. And of course each of these stories have teddy bears hidden in the scene. Josh Edwards and Illustrator Emiliano Migliardo have teamed up to help children learn about the Bible stories in this activity based kids book. Each picture has stuff to find, (i.e. different animals, people, activities) and fun things to look at. They also include the scriptural references to each story so that you can talk to your kids about what is right about the picture and what is just plain silly. I have three kids that have enjoyed this book. My four-year-old likes to look at the pictures and find stuff; my six-year-old is better at it and likes to talk about is off about the pictures. My eight-year-old enjoys the book but was initially disturbed that the author and illustrator could mess up these stories so completely. All and all the kids like and it is a fun, non-serious way to get them to engage with the Bible. The illustrations are cartoony and fun and another plus is the durable glossy pages which thus far have survived my seven-month-old. I give this four stars. Note: I received this book in exchange for my honest review from Kregel Publications and Candle Books.